The City of Cape Town’s Executive Mayor Patricia de Lille will host an inter-faith gathering of various religious leaders to pray for rain on Thursday at 2pm. representatives from various churches, the Muslim Judicial Council, the Western Cape Christian Ministers’ Association, the Western Cape Traditional Leaders and Cultural Council, the Khoisan Griqua Royal House, the Bahaí Community of South Africa, the Tushita Kadampa Buddhist Centre, and the Hindu and Jewish communities. Right. A few issues here. And I’m not going to spend too long on going through these. I’m too irritated to elaborate on stuff. It’ll involve swearing. Even this condensed version may involve swearing. Seriously, I’m literally just about to write it, and it really feels like it will involve some swearing right now. 1. Prayers don’t work. Evidence for this includes the repeated praying for no more terrorist attacks in Europe. 2. Also that whole Angus Buchan thing on Freedom Day. 3. And the annual SA Police Service prayer day for no more crime. 4. If prayers do actually work, then why didn’t you pray for rain earlier? 5. Oh wait. You did. And it didn’t work. 7. My rates – including my (understandably) inflated water tariff – are paying for you to attend this crap. And that’s annoying, because no matter what you were doing instead of sitting on the bloody mountain with your friends chatting to their various sky fairies this afternoon, it would offer me and the rest of the city’s ratepayers a far better return for our hard earned money. 8. If, when it rains tomorrow, as it is forecast to do (and as it has been forecast to do all week), and you or your god-bothering mates then claim that your Table Mountain meeting has yielded positive, tangible results, I may just go flipping postal. In a very reserved, British way, obviously. Very restrained on the language there, well done me. Look, I know you’re not going to read this, Patricia. I know you’re not going to read it because you never read my towing an iceberg from Antarctica and dumping it in Franschhoek solution to the current water crisis; a solution which I have implored you to respond to on several occasions; a solution which I made up merely for comedic value, and which – although mathematically sound – is laughably far-fetched, but which would still be a better way of addressing the drought than you wasting everyone’s time and money on shouting at the clouds this afternoon. Firstly, it’s going to be brilliant, exciting, amazing; and secondly, Bafana Bafana don’t stand a chance. We’re talking cat in hell, snowball in hell, fishcake in… hell (?) stuff here. No chance. At all. Not even a little bit. Nil. Zero. Zilch. You get my point. And that’s still one more than Bafana are going to manage*. But we’re all singing the praises of the South Africa Homeless World Cup team this week, who are fresh back from Milan, trophy in hand! Fantastic stuff. That is, until you read the small print and discover that they won the trophy for finishing 16th. It’s all enough to make you wonder if they didn’t just steal the trophy. In the traditional South African way. I’m not suggesting that they did nick it or anything, but getting a trophy for finishing 16th? It does sound a bit fishy. You must forgive me, because I recognise that even being there representing their country was a special experience and an honour for those guys. And I can only salute the great positive work that NGO’s and charities do in organising these sorts of events. But, being a traditionalist at heart, I have to say first, second, third… fair enough. But a trophy for finishing 16th? Well, that devalues thing a little for me. 16th deserves more of a certificate and a pat on the back. A well done and thanks for turning up but there were another 15 teams who were better than you kind of thing. Not a trophy. I am so proud of our National Homeless Soccer Team, who persevered right until the end of the World Cup, beating Malawi in the final. 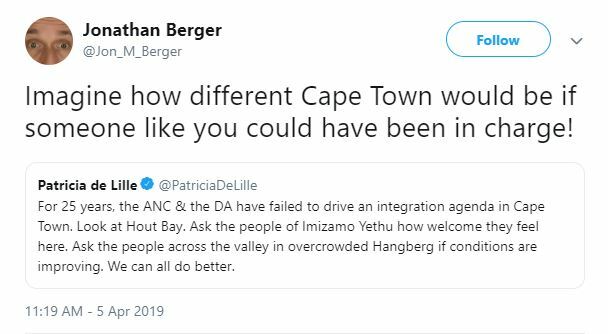 Poor deluded Patricia de Lille is still under the impression that her political party won the recent election and can’t understand why Jacob Zuma is claiming to be President. Fortunately, for the purposes of accuracy in this article, reporter Harriet McLea helped de Lille out by adding the word “(match)” into the published quote at an appropriate point. All a bit of a joke as far as the competition goes, then. But this surely offers some hope for Bafana Bafana in the real World Cup next year. After all, if you get a trophy just for finishing 16th, maybe they won’t be empty-handed at the end of the 2010 tournament. * That’s enough now. Ed.